We love travelling, especially during the month of November, as this, to say the least, tend to be quite a rather grey, rainy and dark month at home in Copenhagen…. The perfect place to be in November…. 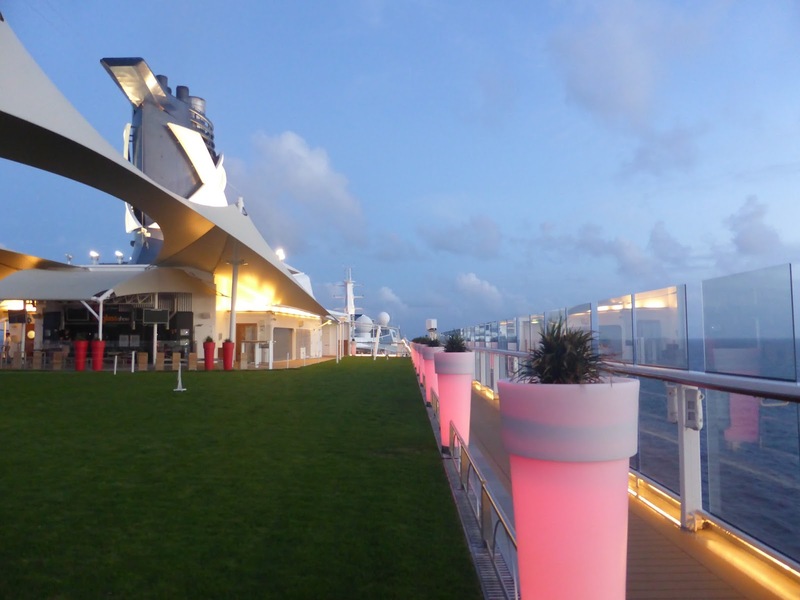 Cruising has become a favourite and this was our third cruise in 3 years. 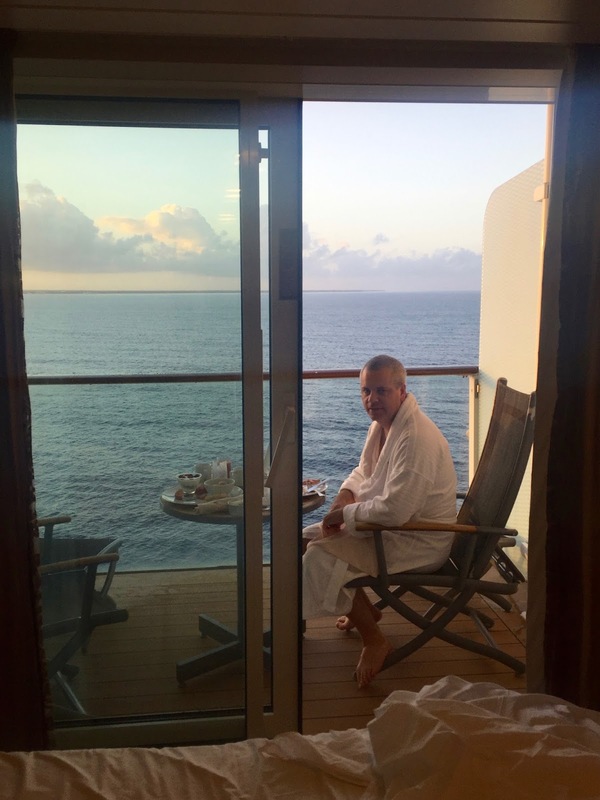 We’ve only cruised with Celebrity Cruises and honestly, we love them so much that we feel absolutely no need or urge to try out any other cruise company. 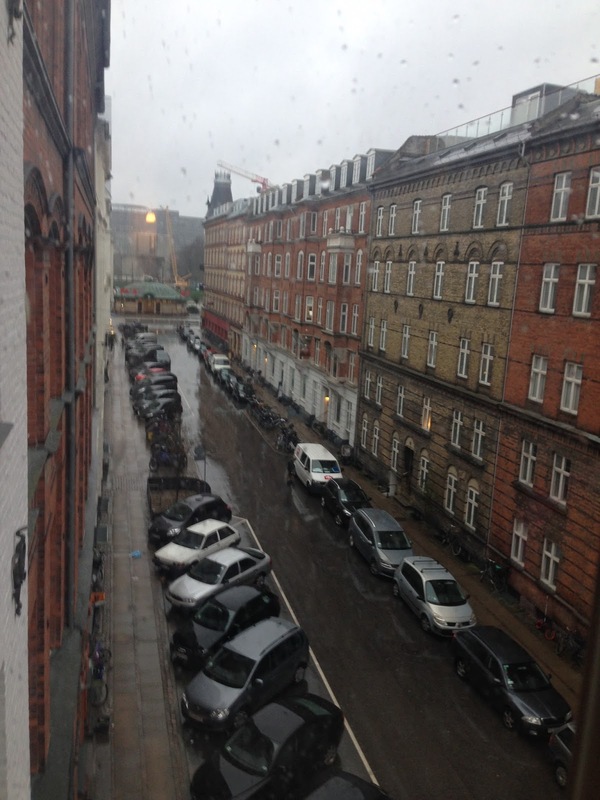 A typical November day in Copenhagen….. 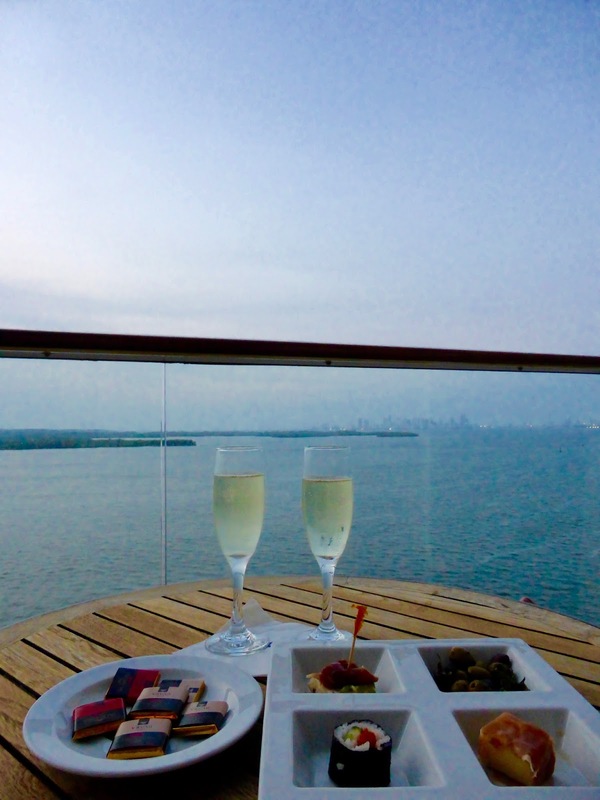 This time, we opted for the 11 Night Ultimate Caribbean Cruise on the beautiful Celebrity Equinox. 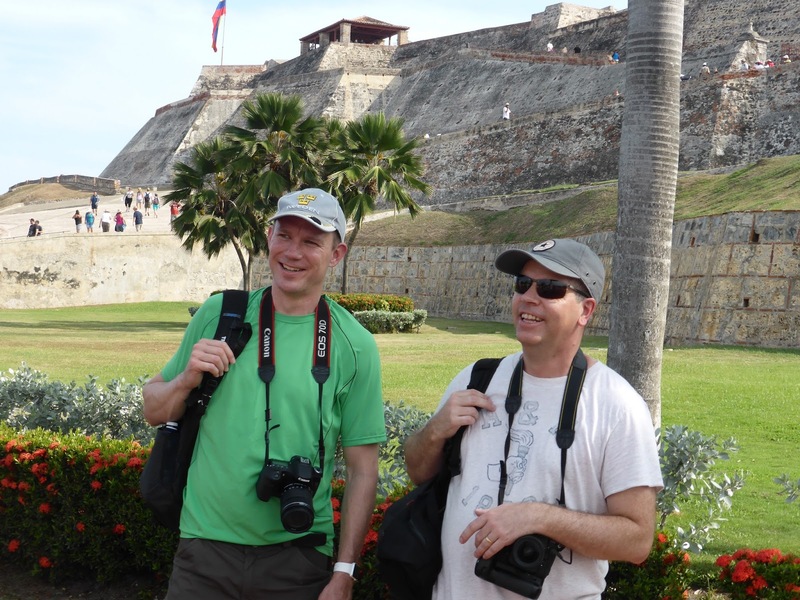 One of the main reasons for choosing this route was the visit in Cartagena, Colombia. 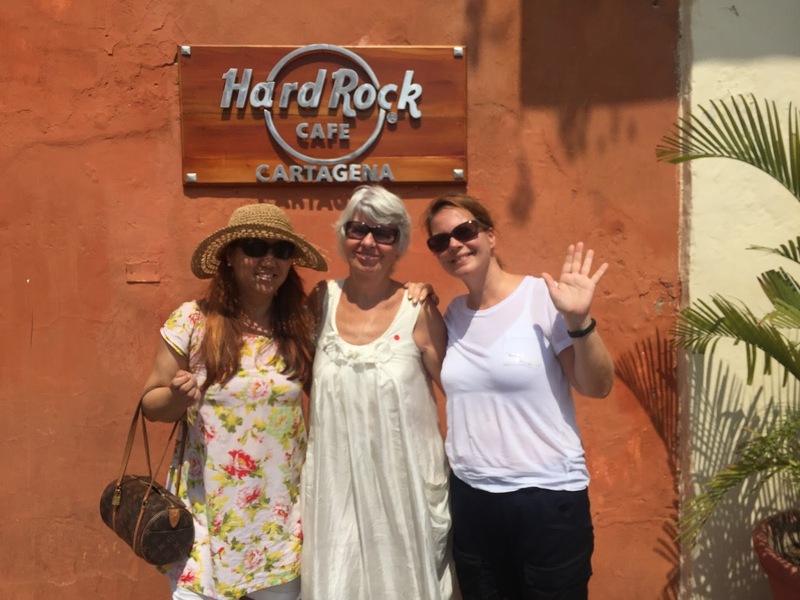 A very well travelled friend of mine, Danish journalist and author, Øjvind Kyrø, once told me that this is one of the prettiest places in the world and since then I always wanted to visit Cartagena. 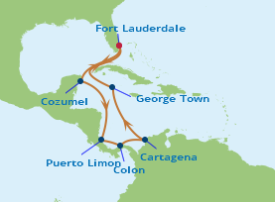 The fact that this cruise would also take us to the rainforest in Costa Rica, as well as the Panama canal also made it easier to choose this particular cruise. 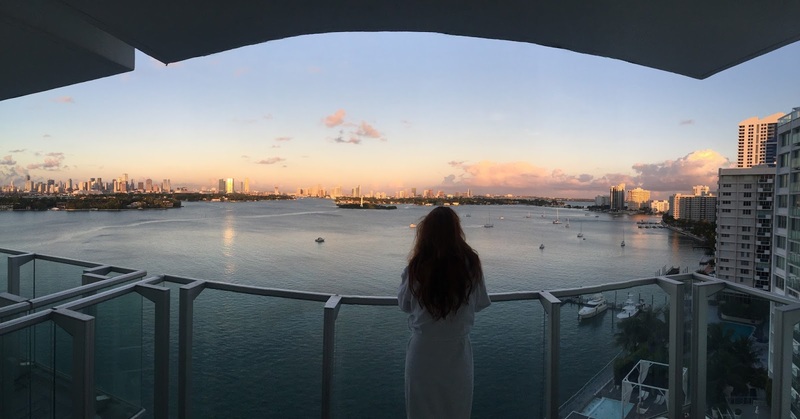 Before boarding the ship at Port Everglades (Fort Lauderdale), we spent 4 days in Miami South Beach at The Mondrian, which was really, really good – can’t wait to return! Checked in and ready to go!!! 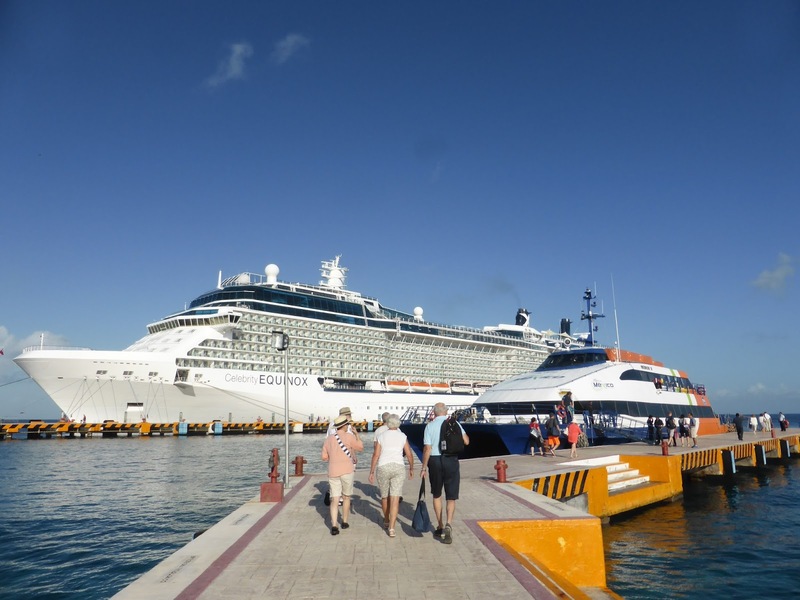 Once at the port, we got to the Celebrity Cruises terminal and straight to the Aqua Class check-in counters. We love the Aqua Class stateroom category as you’ll stay on the top floor(s), right below the fabulous fitness centre and the amazing Spa. For more about this genius invention….have a lookhere and here ! My amazing extra-mum Ulla, Bosse, uncle Tage and me leaving Port Everglades. 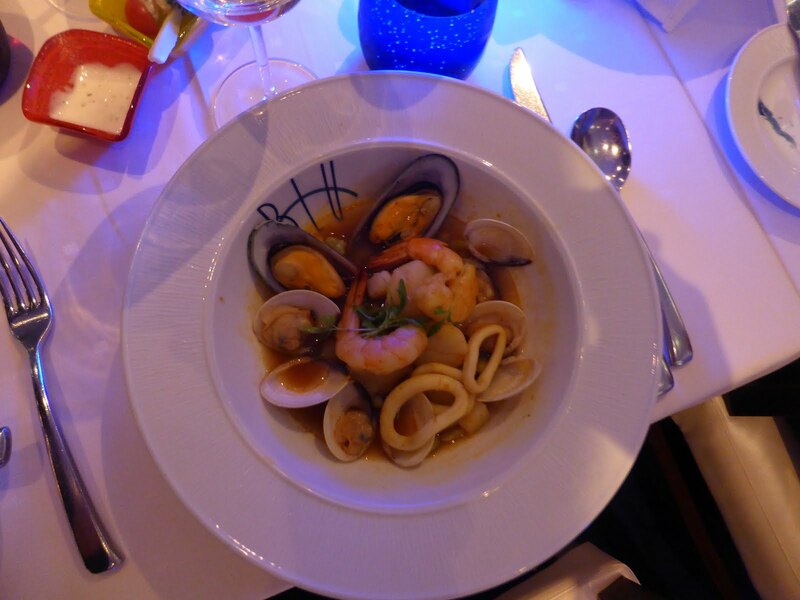 The best thing about Aqua Class though, is that you can dine in BLU instead of the ship’s main restaurant. BLU is a smaller, very cosy restaurant that offers a very unique dining experience and as Celebrity Cruises describes it, it’s “clean cuisine” with elegant dishes with a healthy twist. AND yummy desserts! Boring? Nooooooooooo way!!!! Absolutely delicious! 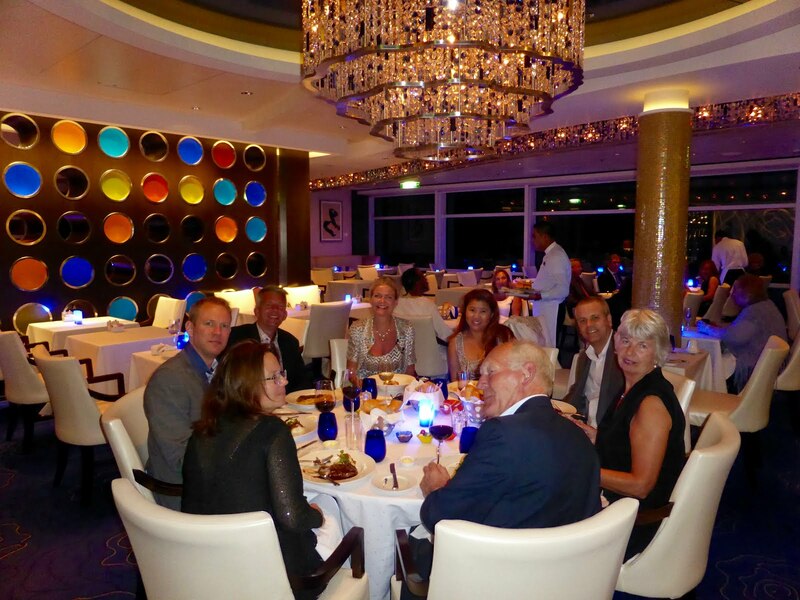 Some gorgeous cruise tourists on a formal night in BLU restaurant. You can also dine at your own convenience so no fixed seating. Love that! 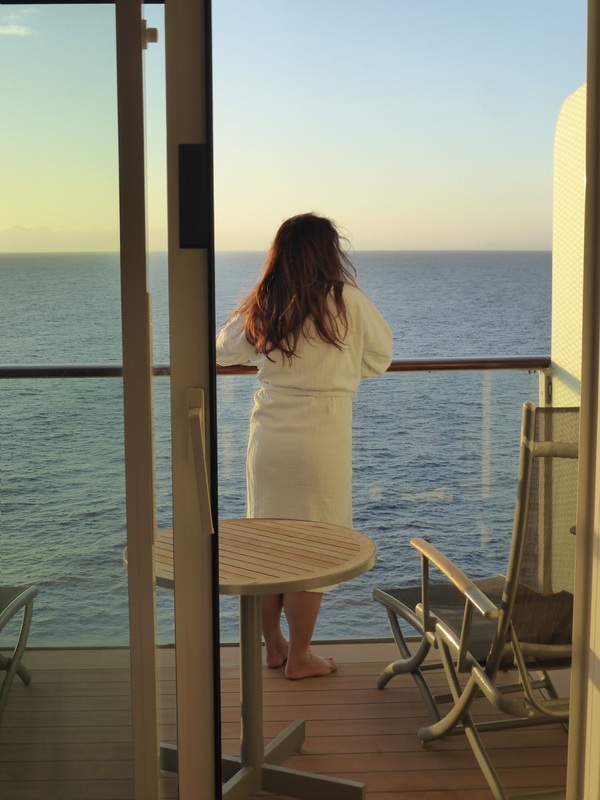 As an Aqua Class guest, you also get an extended 24-hour room service menu and most mornings, we prefer to have our breakfast brought to the room in order to enjoy it outside on the balcony – just heavenly!There are so many options when it comes to food on the ship… You can actually eat 24/7 should you wish to do so….. 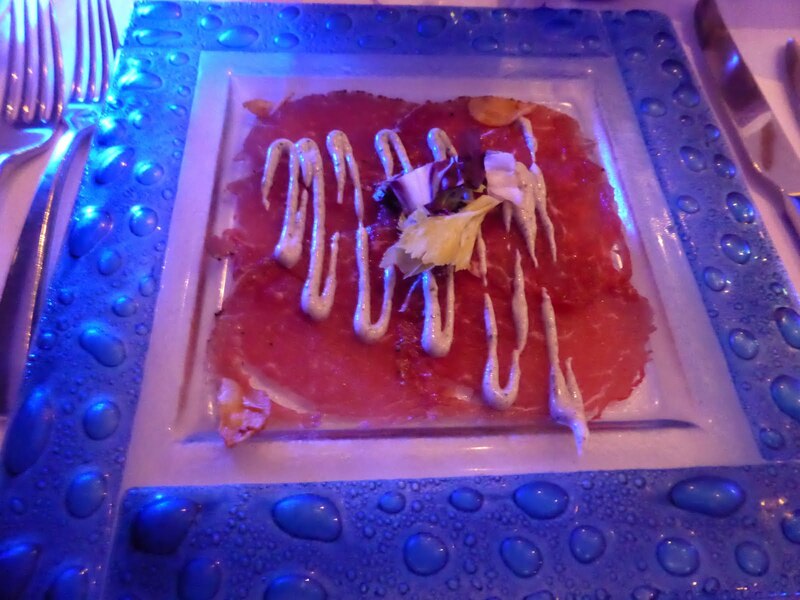 The Celebrity Equinox also has a number of “specialty dining” restaurants as well. Here, you pay a cover charge of approx. 25-45 usd. per person and then you can eat whatever and how much you want – wonderful! 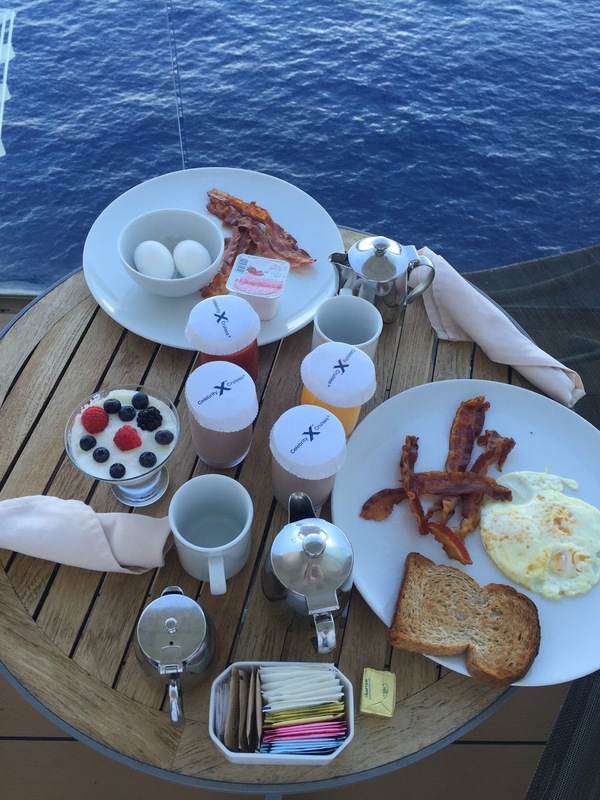 Granola, smoothies, juices, eggs, bacon and more…..all with a full, beautiful sea view…. 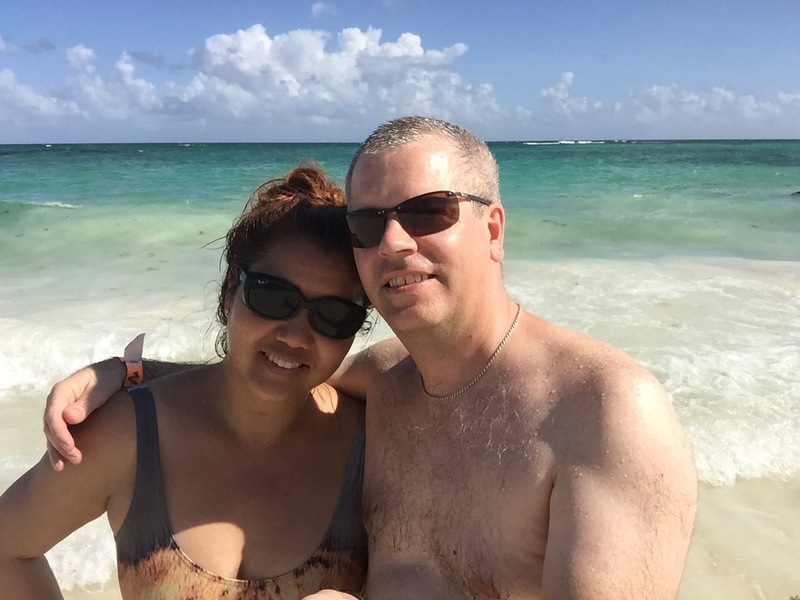 Our first stop along was in Grand Cayman. We’re not divers, nor snorkellers so we decided to take a tour to the Stingray City, about an hour away by boat from the island. 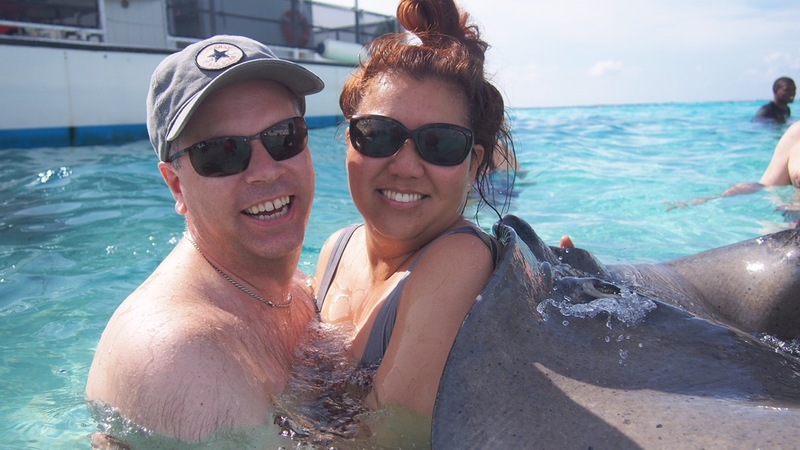 The sand bar was quite big with so many stingrays coming to feed on the octopus that we had brought with us. Not sure if this was good for the stingrays or not – however, it’s a sand bar in the middle of the ocean so it’s really their (the stingrays) choice if they wanna come there or not. We were there for only about 20 minutes and the water was beautiful and so clear! 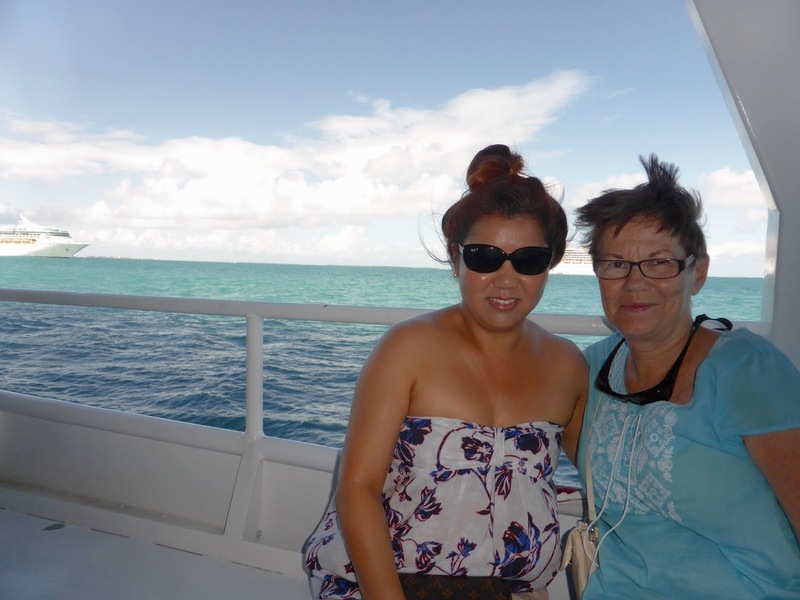 After Cayman, on our way towards Cartagena (Colombia), we had a day at sea. I always also enjoy those sea days as you can just relax and enjoy the ship. 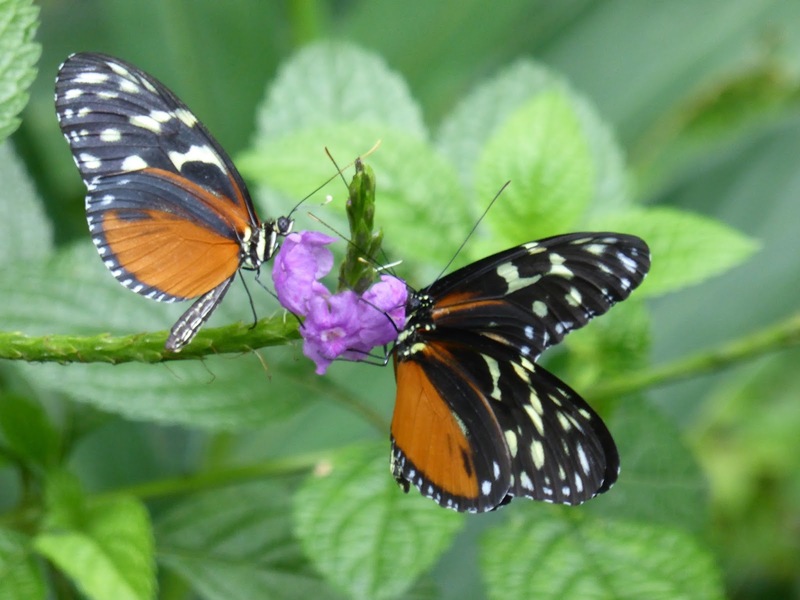 There’s so much to do and time just flies…. We’d start the day by sleeping late, then order breakfast on the balcony and sit there for a few hours just enjoying the view of the endless ocean. 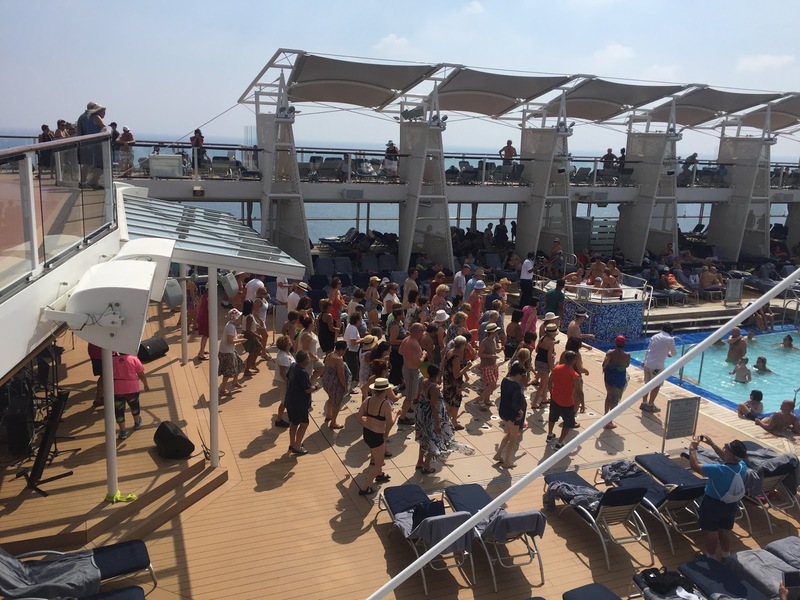 Before lunch time there’s always a possibility of having a dance at pooldeck with the other crazies….So much fun! 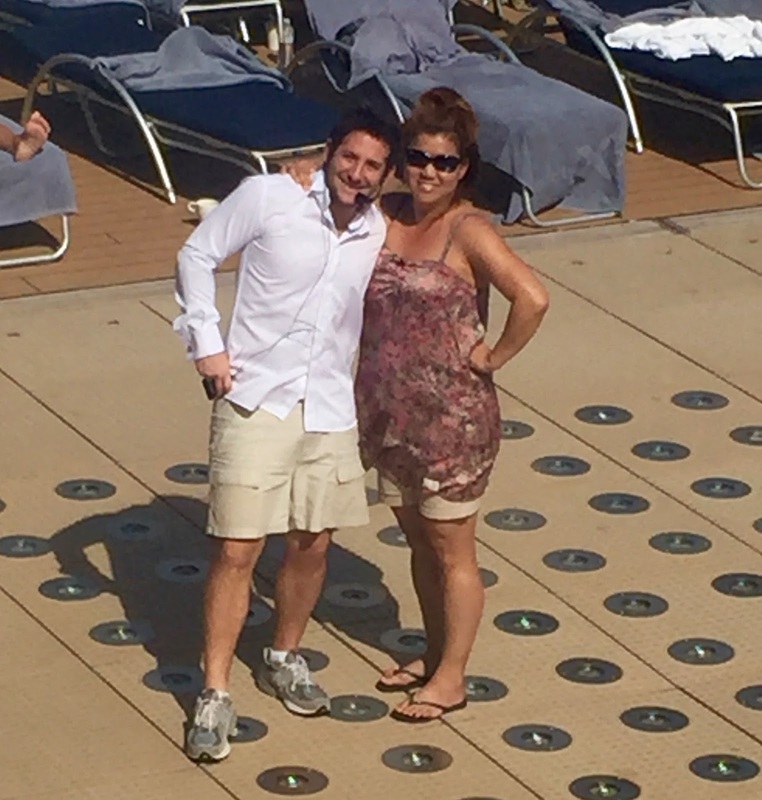 Best cruise director so far – Alejandro from Argentina! Then of course, after lunch, there is also the possibility of visiting the gym…. 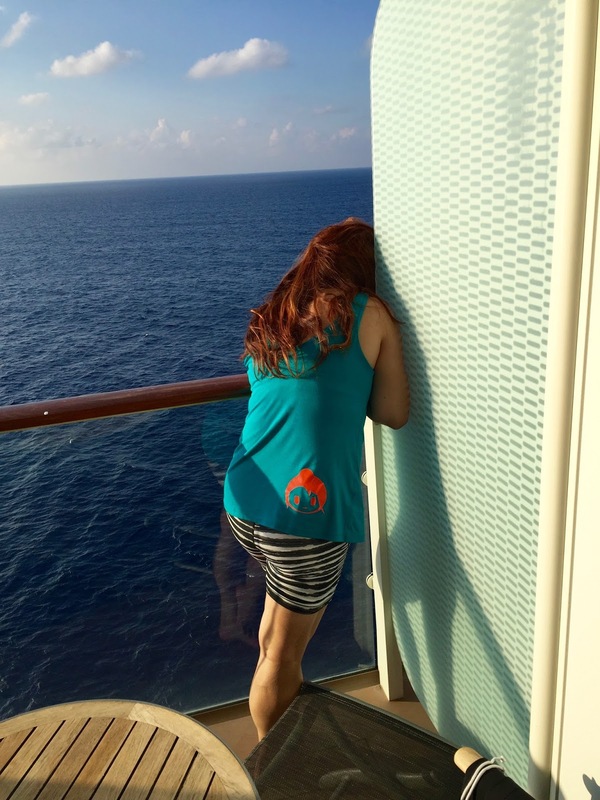 located just above our stateroom (love that name for a cabin)….. It really is a great gym with panorama windows towards the sea. 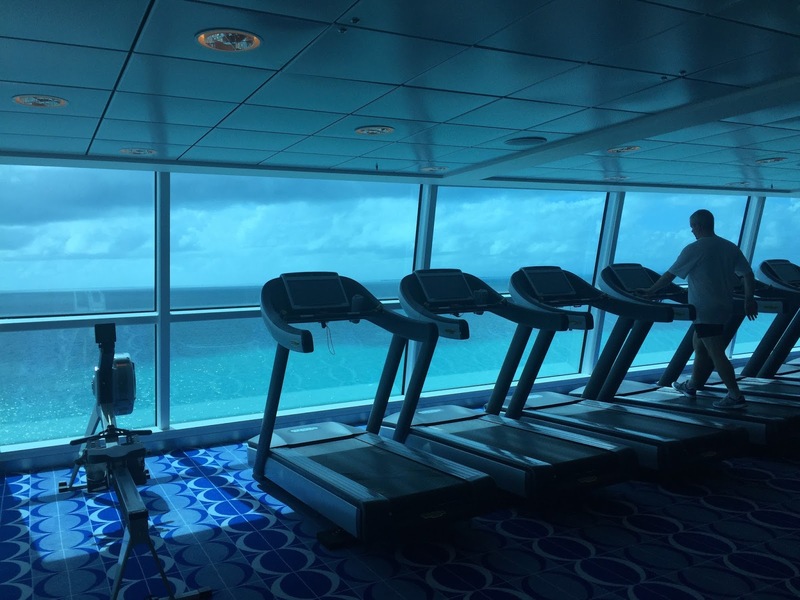 If you can’t feel motivated to exercise here…then you have a serious problem. When done, there’s a fridge with ice-cold, wet towels to wipe off your face with… I spent a few hrs on the treadmill and took some zumba classes (first time ever!) with a great instructor! If you’re not into exercising, there is also a nice library, you can take iPad/iMac/i-something-else classes, do wine tasting, listen to interesting lectures (about anything from shopping to gemstones, the ship’s engineering details, the next port of call and so on..), relax on pool deck, relax on the grass lawn, visit Santa’s photo studio (if that time of he year), go to the spa, go to the shopping arcade, enjoy the theatre or just do nothing on your balcony. 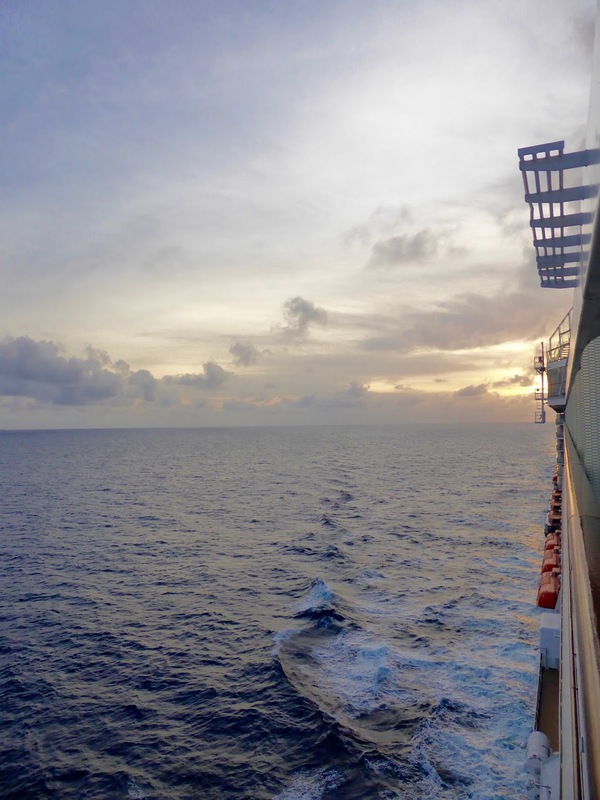 That’s what I love about cruising – there is so much to do…. and there is also absolutely nothing to do, should you wish so. A tiny part of the very spacious fitness centre. The old town of Cartagena (Colombia) was absolutely stunning. The old Spanish inspired houses were beautiful and most of them very well kept. The colours, the light….. all so pretty. 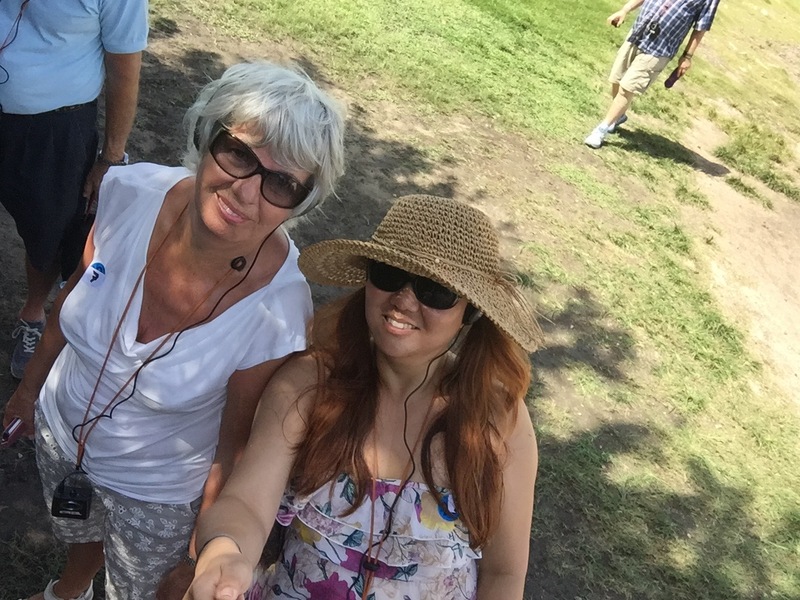 We took a tour that included a walking tour and I loved every minute of it. My friend, Øjvind, had recommended I visited the Santa Clara Hotel, an old convent turned into a hotel by Sofitel. It was a tranquil oasis that made you feel like you had stepped back into the last century. 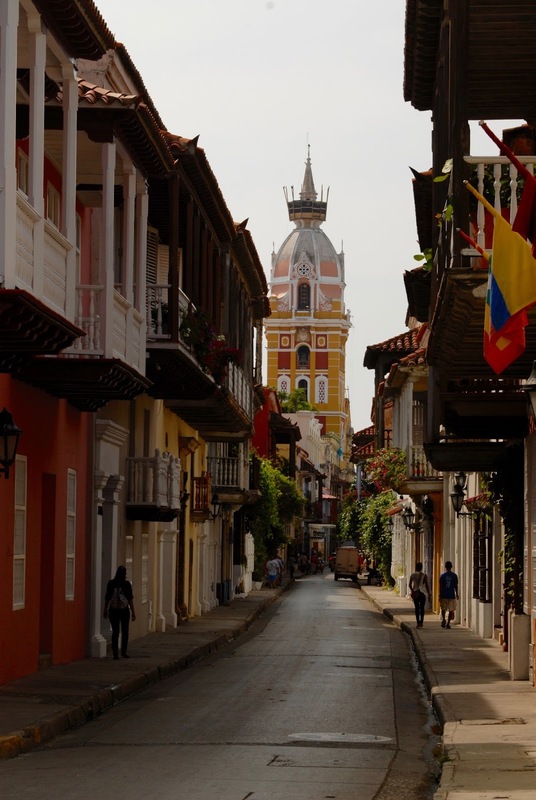 I’d love to return to Cartagena and stay here for longer – without any doubt the most beautiful “old town” I’ve seen so far. I’d also like to see more of Colombia one day. From here, the Equinox took us to Colon, Panama. 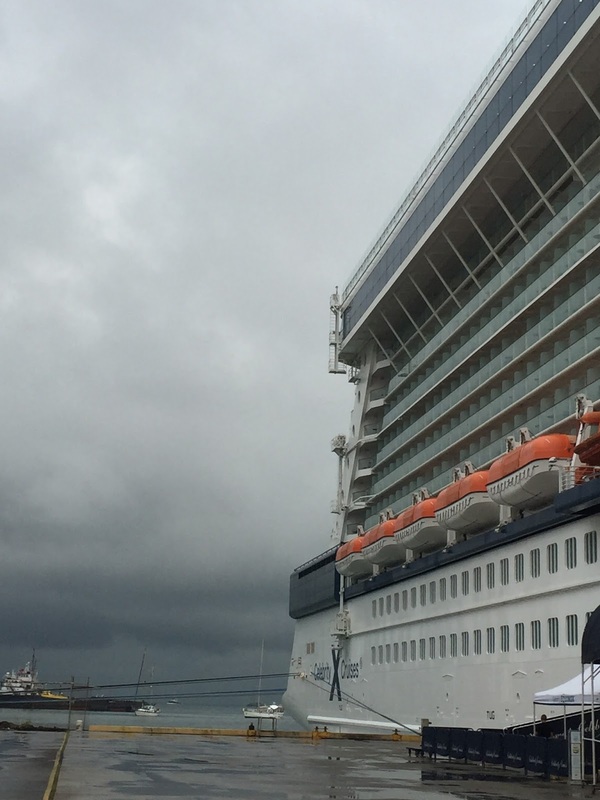 You could say that we arrived on a rather, grey morning…. 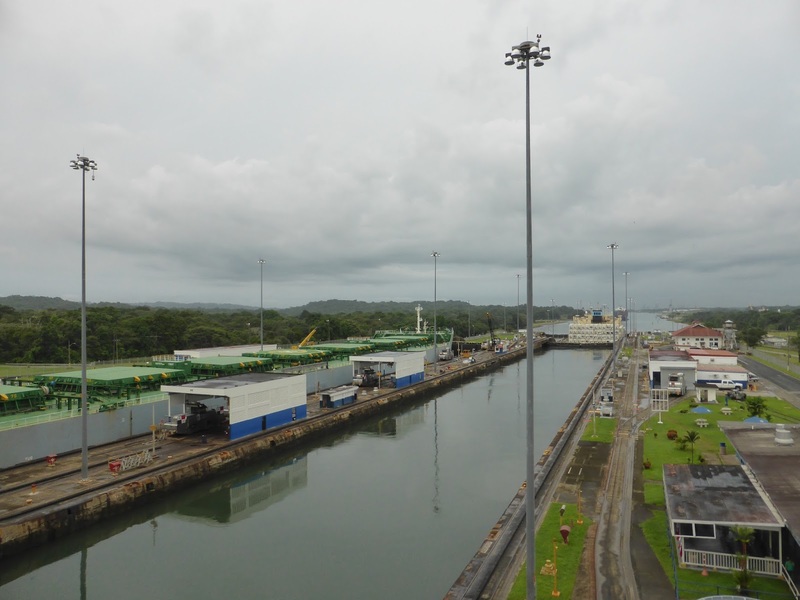 However, this port of call was another highlight of the cruise and we went on a tour to the old town of Portobelo and Gatun locks at the Panama canal. The drive to Portobelo was really nice as it took us to the countryside and we saw lots of local life along the road. 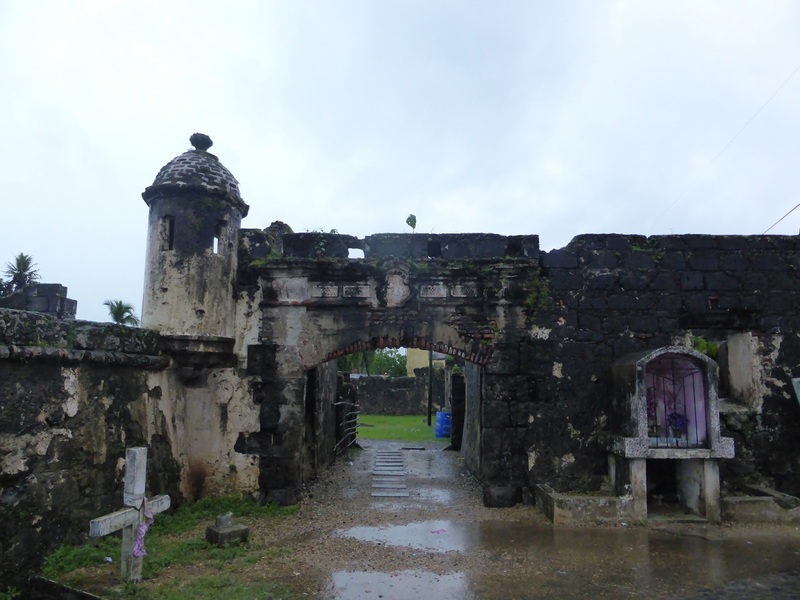 When we reached Portobelo, a very heavy rainfall started so only about ten of us went outside to look at this old town. An old port village, established around 1597, with a very natural deep harbour, used by the Spanish. 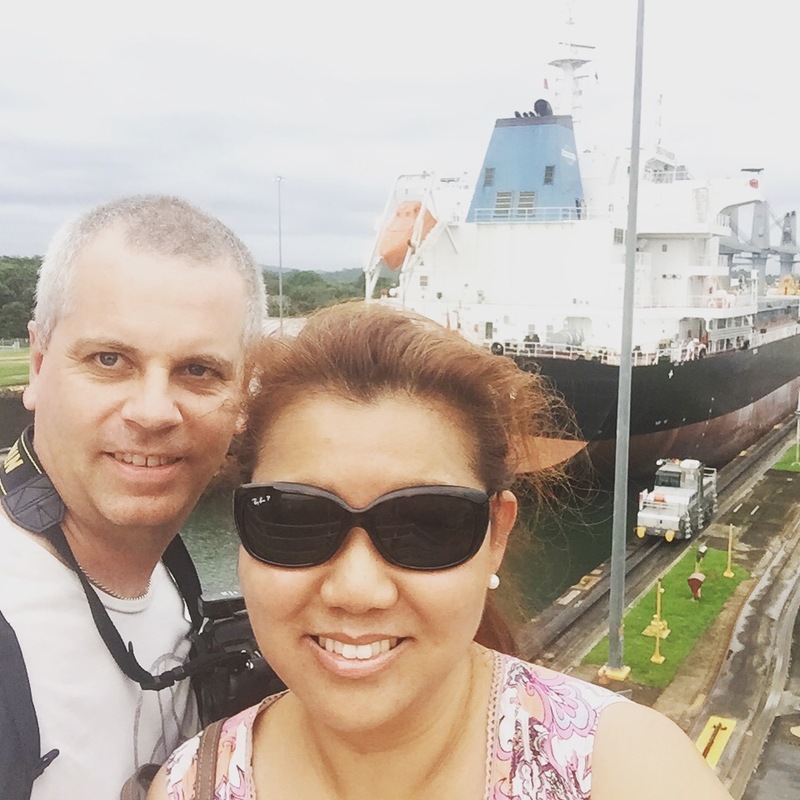 From Portobelo, we continued towards the Panama canal and the Gatun locks, the Caribbean side of the canal. The rain just stopped minutes before we arrived so that was just perfect timing! The canal lifts ships 26 metres (85 feet) and it’s a truly impressive procedure to watch. 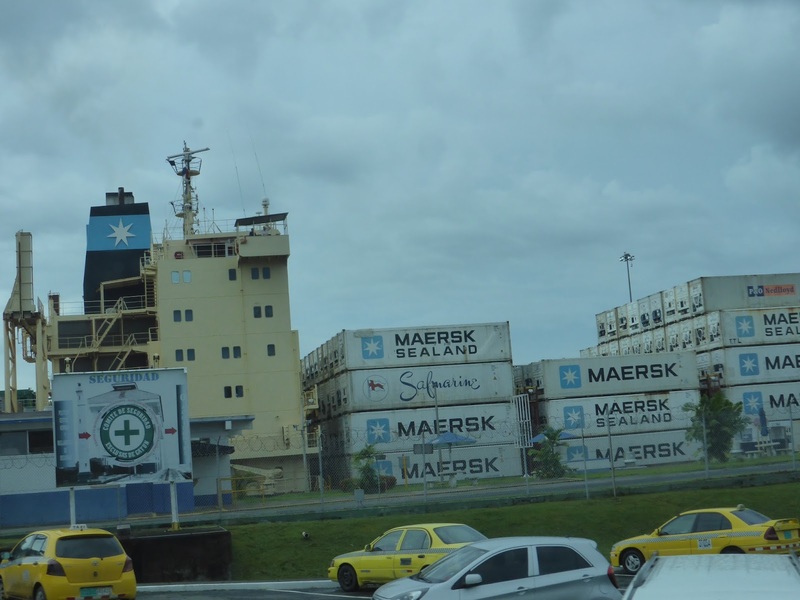 We arrived just in time to see Danish container ship, Nora Maersk, make her way through the Gatun locks. Would be great to do a cruise some time that passes through the canal. Wow!!! 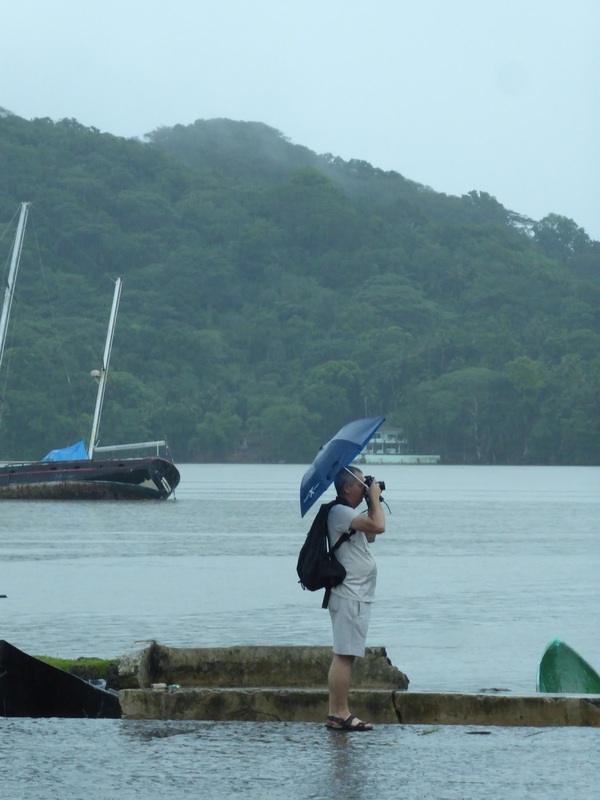 From fascinating Panama, the cruise continued along the coast and our next port of call was Puerto Limón in Costa Rica. Costa Rica always sounded very exotic and mysterious to me and I never thought I’d visit this country. 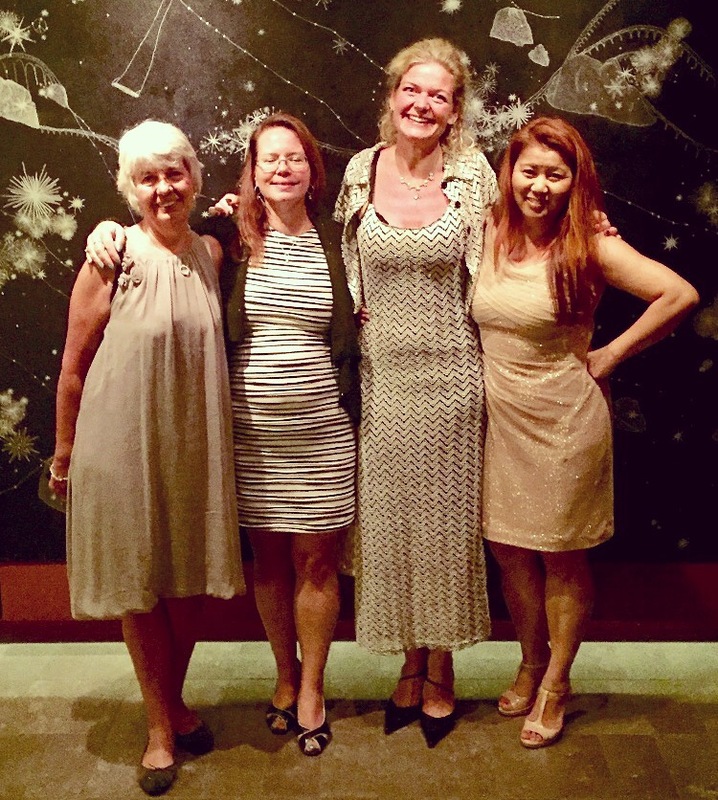 To me, it always meant exotic rainforest with beautiful, colourful birds and of late…. Jurassic world…. 🙂 However, I found out, that Jurassic World was not shot in Costa Rica… Bummer…. 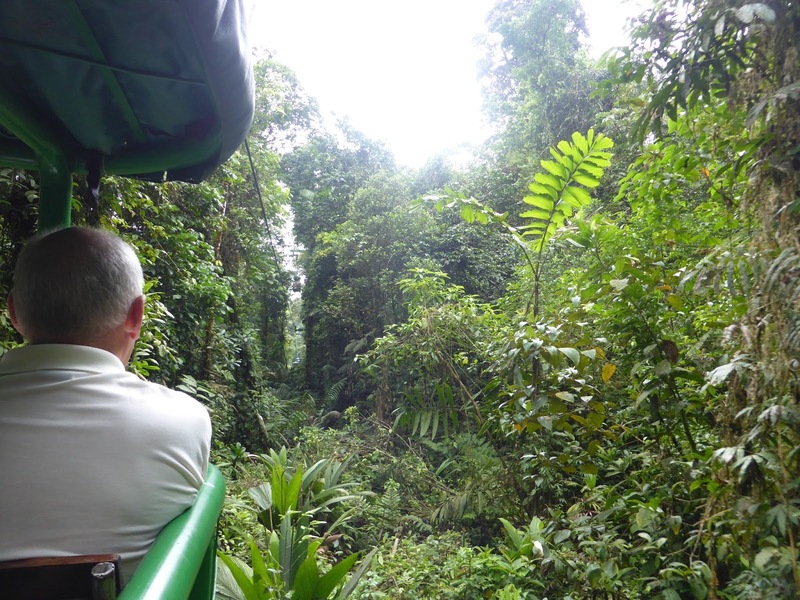 There were, yet again, soooo many shore excursions to choose between and we ended up taking a tour to the rainforest, which incuded an 80-minutes aerial tram. The staff at the shore excursion desk at the ship are very good to inform and help to explain the differences between all the excursions. When in doubt, I can highly recommend you go ask them, they have the answers to everything! After a very scenic busride that took just about close to 2 hours, we arrived to the national park and despite having lived 11 years in Africa and seen rainforests there, this was the greenest place I’ve ever seen. Very impressive! The lush vegetation made the air feel so extremely fresh and clean and I really, really enjoyed being there. 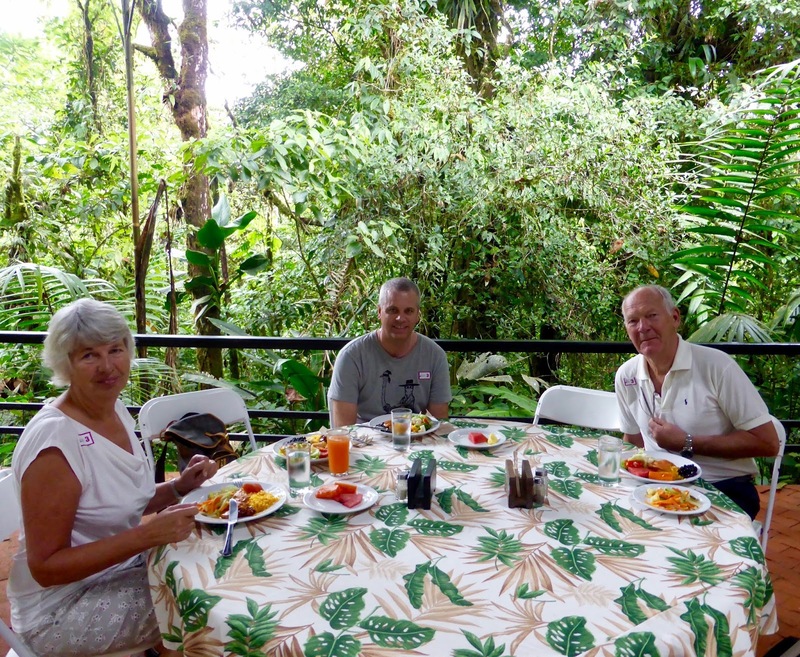 The aerial tram ride was very nice and we were anywhere between 10-45 metres above the rainforest during the tour. Our guide had so much knowledge and told us absolutely everything we needed to know about the vegetation and the animal life in the park. He talked without any break whatsoever during the 80 minutes and I wish we’d had just 10 minutes (or more) of total quietness in order just to be able to “listen” to nature itself. Before heading back to the ship, we had a lovely lunch out on a terrace. A buffet styled lunch with local dishes like beans and chicken – all very delicious! I’d love to go back and visit Costa Rica as the country is so beautiful and has so much to offer! A very idyllic place for a lunch break. 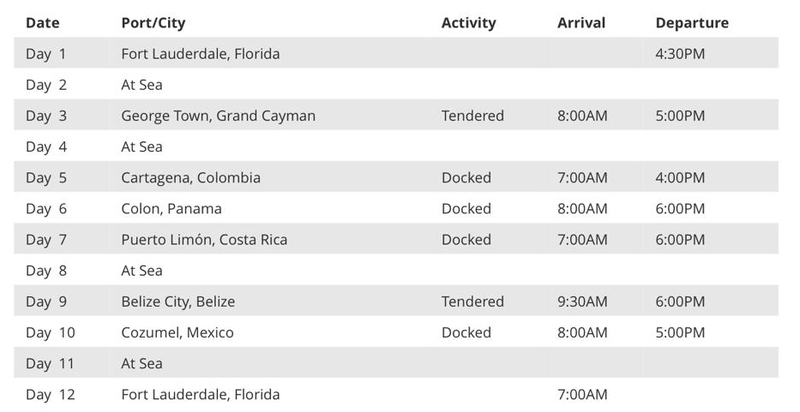 The ship was tendered a bit outside the port (guess it was because of the coralreef) and it took about 25 minutes to get to the port. Later on, we did decide to go ashore and went to visit some of the shops in the port. 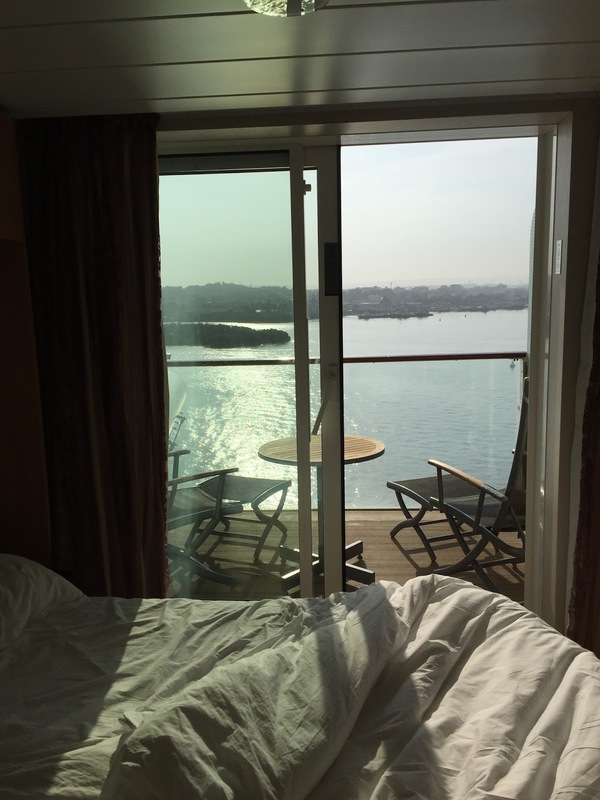 This was the first time on a cruise that we actually just stayed on the ship while at port, and I must say it was nice. Our last stop on the cruise was Cozumel, Mexico. 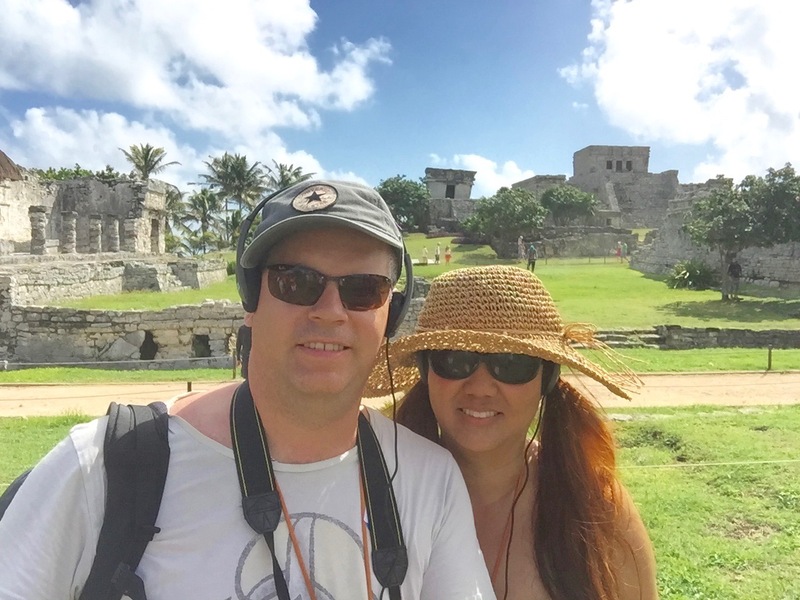 We were here on our cruise last year and chose to do the same excursion to Tulum ruins with a beach break afterwards. A great excursion, starting as you arrive in the port in the morning and you get back to the ship just minutes before it departs again. The ruins in Tulum are very interesting and this time we had a really good guide (Felipe) that made it all seem even more interesting. After a tour of the ruins, we drove to a private beach club for lunch and a swim. I did miss the beach club from last year’s trip, as the restaurant was a lot nicer with an outside terrace and much smaller and personal than this one. However, the beach itself and the water was, of course, just as great as I remembered it….. Stunning beach with beautiful water!!! Definitely one of the best beaches I’ve ever been to. 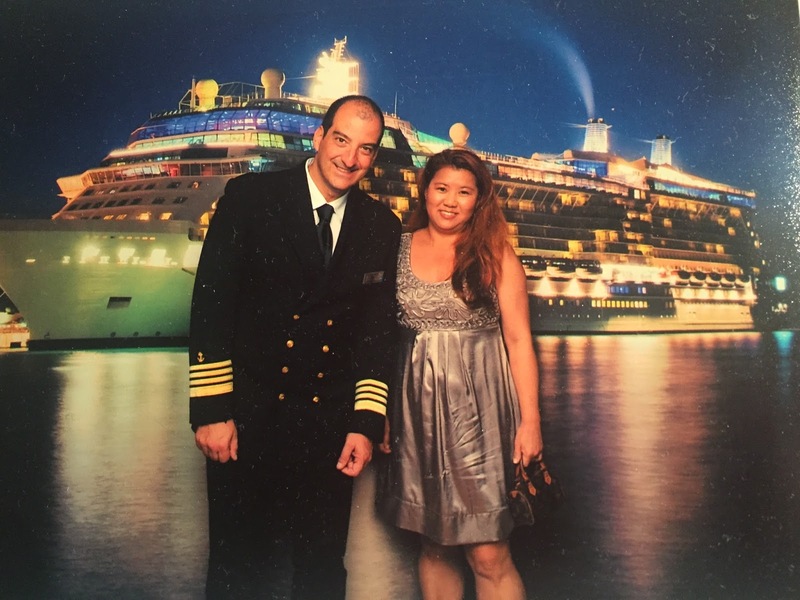 During an 11-night cruise, there are also two “formal” nights where the dresscode is – formal. It’s nice to see all the beautiful dresses, gowns, shoes and jewelry that the guests from all over the world are wearing. If you really don’t wanna do formal night, you can have dinner in your stateroom or maybe at the casual Ocean View Café. As always, it’s really hard, almost painful, to leave the ship once back at the port in Florida. 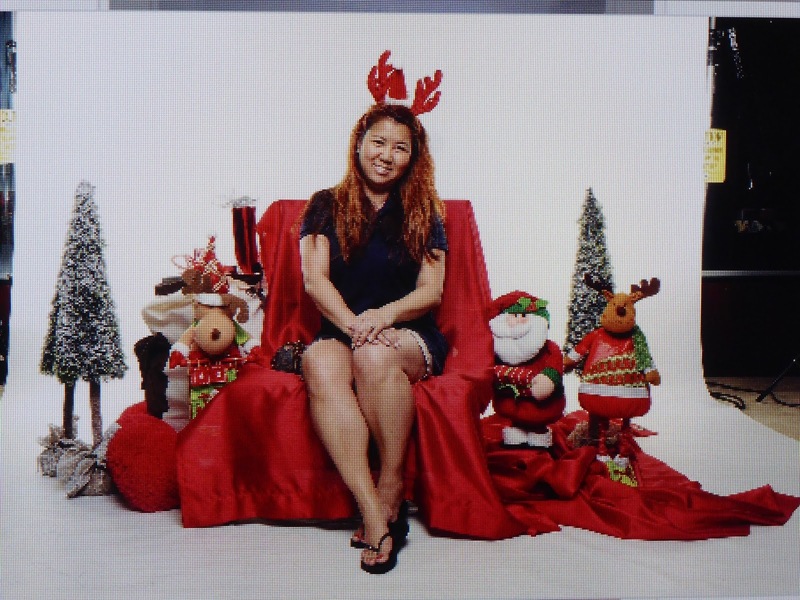 After being spoilt rotten and having someone taking care of your every need, it’s kind of scary to return to the real world and reality, as you have to start thinking yourself again…. 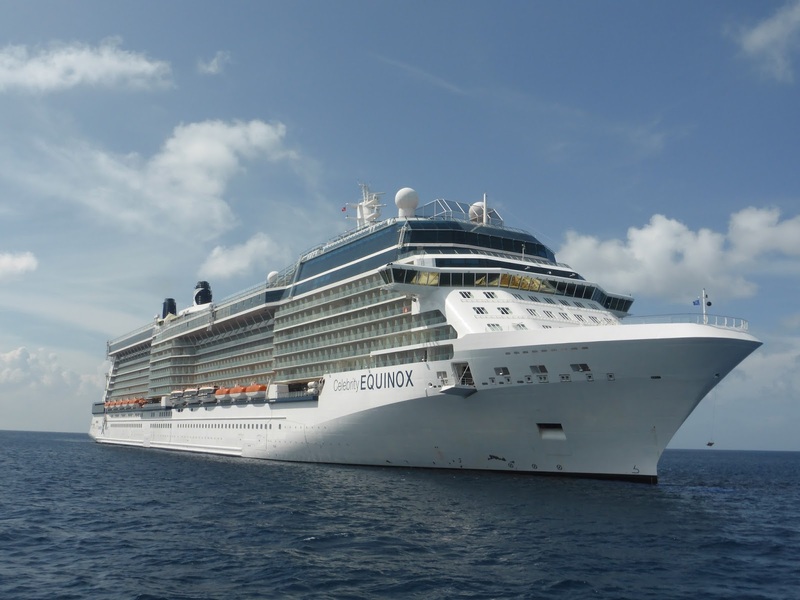 I always feel a bit sad when I disembark after a great cruise but it’s also really nice to know that there’ll always be another cruise to look forward to with Celebrity Cruises. The options are endless. 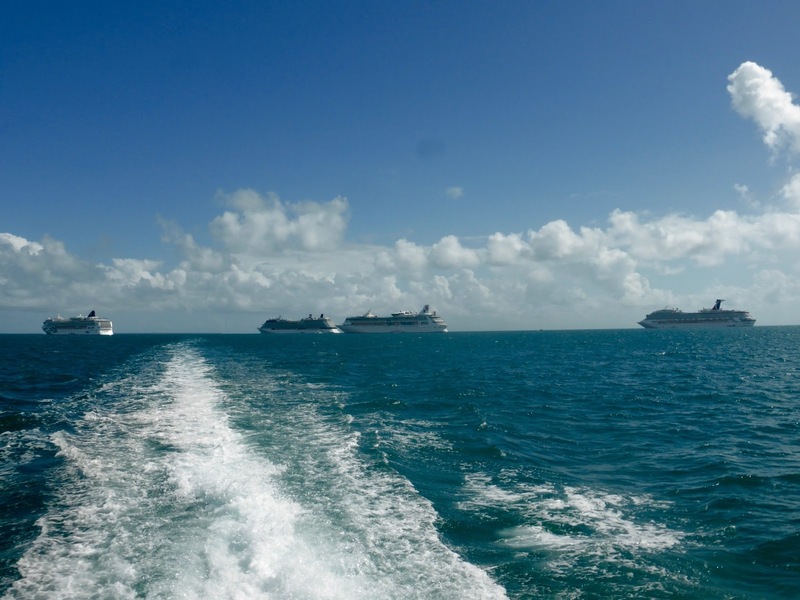 Can’t wait for the next cruise to come though……. Bye, bye and many thanks to Capt. Panagiotis Mantzavinos and the Celebrity Equinox. Lovely!!! Can't wait to try one. Alltså någon gång ska vi med. Det får bli typ 2020 eller nåt ;). Underbar läsning!